I first became acquainted with Askinosie Chocolate, when Pam Williams of Ecole Chocolat gave me a sample of a single origin white chocolate bar, made from Trinitario beans grown in the Soconusco (Chiapas) region of Mexico. I don’t really love white chocolate. I have always considered myself a “the darker the better” type, but I am slowly learning that this is not always true, and that I have been shutting myself off from a whole palate of wonderful flavours. Besides which, this is unlike any white chocolate I have ever seen, let alone tasted. Warm, honey-coloured squares with a healthy snap, and aromas of fresh field flowers and something tangy, remind me more of Scottish tablet than any white chocolate I have seen. 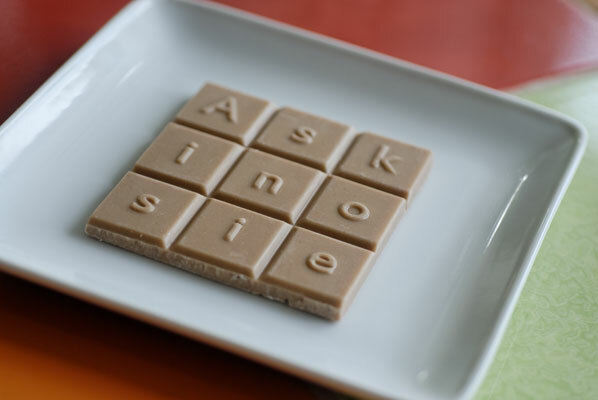 Askinosie Chocolate is the first small-batch chocolate maker in the United States to make white chocolate from the bean. It was a bit of an afterthought, according to Shawn Askinosie, the owner of this fine company. But because they were already making single origin cocoa, and single origin cocoa butter for their dark chocolate, they had the finest raw materials to hand. 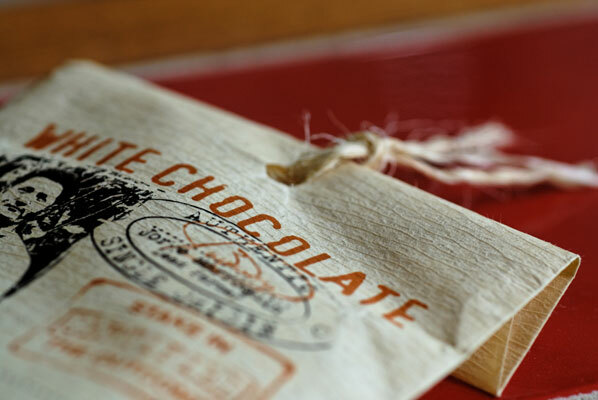 I love the fact that right on the front on the package, there is a picture of the lead farmer, a number where I could trace each step in the chocolate bar’s story, from harvest to packaging and that all the packaging is compostable, and some of it re-used (the strings on the top come from cocoa bean bags). The package design is something very important to us. I designed the packaging and engaged a local graphics company to execute it. I source all of the package materials. The entire chocolate bar packaging and our “marketing identity” has been carefully considered to reflect who we are. More importantly, the packaging was designed to honor the farmers. In fact, the package itself impacts the taste of our chocolate bar. No other chocolate maker, that we are aware of in the U.S., is receiving this kind of attention regarding the packaging design. This is a key competitive advantage. We do not use a marketing firm to originate design any of our product or packaging ideas. Again, this goes back to knowing who we are. Enough for me to want to try it then, based upon that picture, the packaging, and that story alone, but the taste of this white chocolate is unforgettable. Made with single origin cocoa butter, organic cane sugar, and goat’s milk powder, this white chocolate tastes like a spring day on the farm: grassy, tangy, toast and brown sugar. Nice melting finish, with more body and a slightly sharper edge. In short: more-ish. So many of the students and graduates I’ve talked to through the Ecole Chocolat course, have come to chocolate making after pursuing another career, and Shawn’s story is fascinating. I had the good fortune to speak to Shawn, the other day, as he generously took some time from roasting to talk to me on the phone. Shawn Askinosie spoke to me by phone from his office in Springfield, Missouri.